So you have decided to bring home your new kitten. It is a soft, lovable ball of fluff and fun; as cute as anything and a great addition to your family. But, what are the secrets for having a happy and healthy kitten? Well it is not a daunting task and with just a few tips you should be able to forge a life long bond with your new companion. Your new kitten is going to be very curious about its’ new home and as it is just a small animal it can get into all sorts of small nooks and crannies – especially behind kitchen units, gaps in the wall and behind appliances so please block off any gaps. Also keep the toilet seat down; cats and kittens can be fascinated by water and you do not want your new pet to fall in the toilet and get trapped and drown. Plus people put all sorts of chemicals down their toilet which can be detrimental to your kitten’s health. Cats and kittens love to chew and if they spot an electrical cable they can chew on these. As cat and kitten teeth are sharp they can easily chew right through the sheath and electrocute themselves. It can also cause a fire in your home. Therefore either keep cables out of the way of your new kitten or use a cable protector which goes around the cables and will stop your cat from chewing. Cats love plants and cats love chewing. However, some of the most popular houseplants are toxic to animals (plants can be toxic to cats whilst being non-toxic to other animals such as dogs and vice versa). 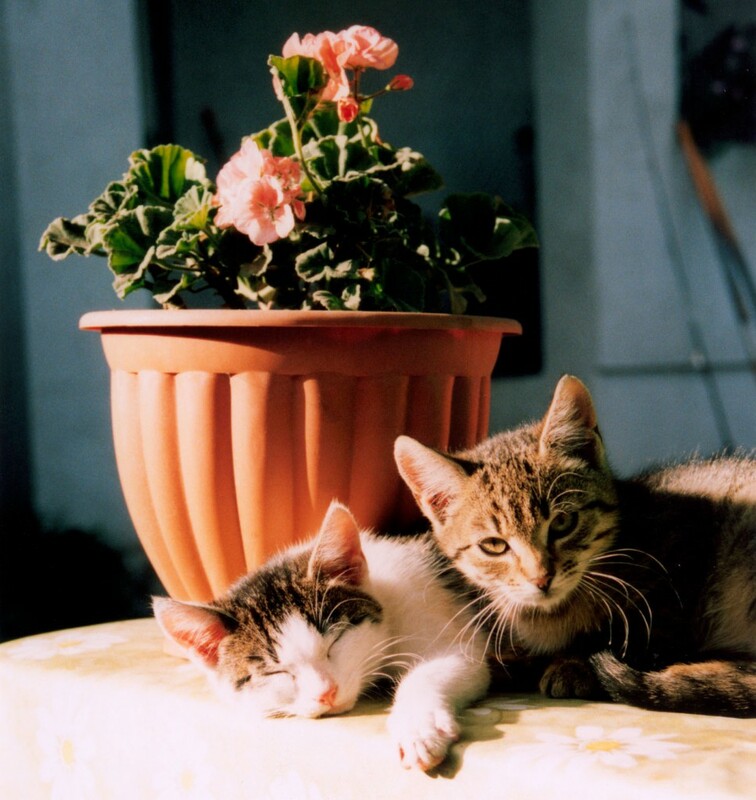 Some of the popular houseplants that are toxic to cats are weeping figs, dragon trees, yucca plants and rubber plants as well as some flowering plants. So please check whether your plant is toxic to pets. I list ten non-toxic houseplants for cats in this post. To minimize any tummy issues in the first few days then continue to feed your kitten the food that it was eating before it came home with you. Gradually then, introduce new food – mix a little with the kitten’s current food at first. Choose a high quality food and one that is high in protein – it can be dry or wet food but remember with wet food not to leave it out for long periods of time as it can spoil. Also, in the first couple of weeks your kitten will want to eat little and often. Give your kitten easy access to fresh and clean water and make sure it is in a sturdy bowl that cannot be tipped over as they will rest their paws at the top of the bowl. Many people now use water fountains as they constantly move the water around. Many people think cats want to drink milk but after weaning, a kitten should not need milk. As they get older their tolerance to lactose greatly decreases and milk can make them sick, give an upset stomach and cause diarrhoea. If you really want to give milk to your kitten then pet stores usually sell specially formulated lactose free kitten milk but in reality your kitten only really needs water. Cats are naturally very clean animals and will usually be toilet trained within the first 8 weeks. When you first get your kitten home, keep it in the same room as its litter tray or place the tray in a very easily accessible spot. Also do not have high sides on the tray as your kitten is going to have to climb inside. If you do get a toilet accident occurring then clean up the area with hot water and you can get sprays from the pet store that break down the enzymes within cat urine to erradicate smells. This also helps the kitten from smelling this area again and thinking that it is their toilet area. There are also a large number of different cat litters on the market and their use is personal preference – both yourself and your cats. With a small kitten then do not buy heavily perfumed litter as this can be an irritant to your kitten’s skin and also smell so strong to the kitten that it puts them off going to their litter tray. Cats have a more sensitive sense of smell than humans. If you want to have a self cleaning litter box then look at our number one recommendation here. It has an easy step to climb into it very easily. If you have not got any other pets then get your kitten registered with a vet in the first couple of days that it is home with you. By taking it to the vet in its’ first couple of days, the vet will give your kitten a good health check up including taking it’s weight and will check its general health. This will give you peace of mind that you have a healthy kitten. It is also good to get your kitten used to visiting the vet at this early stage and it lets your vet also get to know you and build up a rapport. After all you have a friendly doctor who you feel safe with and your kitten needs the same. Your kitten should have two vaccinations – the first vaccination should be at around 8-9 weeks of age and the second should be just after 12 weeks. (usually 3-4 weeks after the first vaccination). These vaccinations are very important and if your kitten was already over 9 weeks old when it left its previous home then the first vaccination should have already been done. Make sure to get a record that this vaccination was carried out. It is common for kitten to have intestinal parasites such as worms. In kittens this can be dangerous as these worms live in the digestive tract and will rob your kitten of nutrients. Some worms such as Coccidia can also cause diarrhoea in kittens and because kittens are very small at this age then dehydration can be life-threatening. Roundworms are also very common. 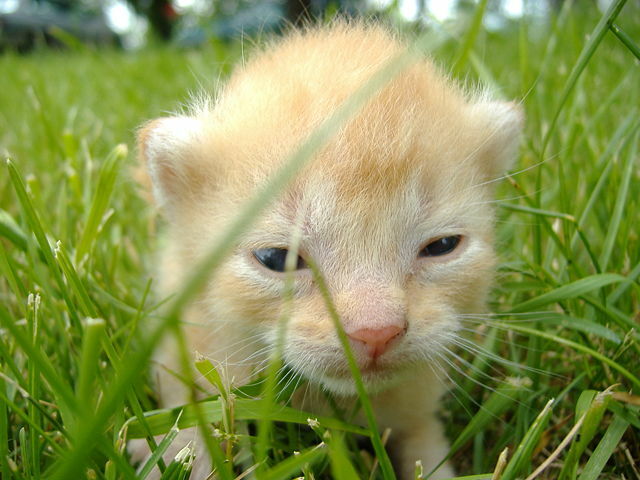 Often your kitten would have been wormed at around 2 weeks old and then it should again be wormed at around 8-10 weeks. Again, check with the person who you received the kitten from to see if it has been wormed. In this early weeks it is best to get worming tablets from your vet. This is because the dosage is linked to weight of the kitten and as kittens are very light it is best that you have an accurate weight from the vet and therefore an accurate worming dosage. Most vets will then advise how often to worm your kitten after this. Fleas are annoying for everyone – humans hate them but for your kitten they can be dangerous. As they feed on blood a heavy flea infestation can make your kitten very weak and very sick. Again as with worming dosage is very important and again it is linked with the weight of your cat so it is best to get your first flea treatment from the vet. It is now regarded that 4 month or less is the best time to neuter a cat. This is because cats become sexually active from 5 months of age and so by neutering earlier you cut down the risk of unwanted pregnancies. Whilst neutering means that there are less cat pregnancies and so lessens the amount of stray cats, it does also have health benefits. Female cats which are not neutered are more likely to suffer health issues later in life. For example, they have a higher risk of mammary tumours and also womb infections. Un-neutered males can be more aggressive and fight with other cats and also wander further if they are outside the house. They can also spray a lot more. It is important to play and socialise you kitten at this age. This will build strong bonds and keep your kitten active and healthy. Regularly pick up your kitten, supporting its hind quarters when you do this. You can also stroke and groom your kitten now as well so that it gets used to being groomed. Be gentle though as it is very small at this age and therefore delicate. Play with your kitten as well – roll balls for it to chase and dangle toys are great for your kitten to try jumping. Though, not too high up as you don’t want it jumping so high that it can land painfully. Hopefully my top tips for having a healthy and happy kitten will bring you both lots of happiness and fun together. However, if you have any concerns about your kittens’ health or welfare your vet will always be happy to give advice. If you have enjoyed this post then click one of the links below to share this post. Great tips for bringing a kitten home! There are a lot of things that I would not have thought about like the deworming. You mentioned pills they can take, are those with a prescription only or can you buy that from a pet store? I remember bringing home a few kittens while growing up and there is nothing like cuddling with a tiny little cat! Hi Thanks very much for your comment. With regards to pills, with young kittens I would advise that pills are from the vet in the first place mainly because dosage is important and dosage is often linked to animal weight. So you don’t want to give too high a dose. Some pet chains do have an instore vet area who would be able to weigh your cat and then advise on proper dosage. I was left standing in the vetenary centre holding an old friend. Our companions were my sister a Vetenary Nurse and a couple of Lethal Injections. Mechanically trying to hold in my beautiful little girl in an awkward position, she never knew what was coming. I did and felt awful. Nothing or no one prepared me either for what happened next as her frail body went limp. My last cuddle under the harsh fluorescent lights. Over the 18 years we were best mates. They say you cannot really tell the emotions of cats unlike dogs, but we knew each other inside out. Laying there in bed as an 11 year old, Inks was due to give birth. On this night, her only solace was me, which was fascinating. We were told cats will find there own corner of the world to quietly give birth well away from humans. Doing twirls on my chest constantly chasing her tail, I soon saw inches from my nose another two little legs and a tail. She had her first kitten on my chest and stayed with me until I freaked out a little. She had a further 3 kittens that night and our two warring adult male cats stood guard not allowing anyone of us in the room where she took refuge. So many memories. On this wonder occasion I just hoped my parents had a resource like this post to work from! I was too busy having fun with the Kittens. What a beautiful story – thank you for sharing with me. I lost one of my cats last year after almost 20 years together – a tumour had pushed its way into her liver and I had to make the decision to let her go. So your words really resonated. I look back fondly on 20 years of fun, of being woken in the morning by her stepping on my head and jumping into my arms when I used to get home from work. Good memories. That’s a great website Evie! I am sure it will be very helpful for people who want to have a healthy and happy cat. I like cats very much but I don’t think I can take care of it.Because it is to much work. My younger daughter,who is nine years old,craves to have a kitten but I resist insistently because I am sure I will be the one who takes care of it not my daughter. I am experienced with my elder daughter. She wanted to have pet. We brought a bird and a rabbit but I handled everything so I have been opposed to pet idea since then.I bought a toy kitten a couple of months ago.My younger one loves it so much. We’ll see, time will show who will win the fight.If I had a kitten, I would absolutely follow your instructions. Awesome advice for raising a kitten! They sure are curious. Of course, since they own everything they see, they naturally wish to explore every nook and cranny. Plus, as you point out, they will get into spots you have long forgot existed! I wish I’d read your advice to close gaps when I got a kitten. Luckily there were no problems, aside from searching for hours only to find the critter sound asleep behind a random piece of kitchen equipment. My cats loved moving water. We would let one of our faucets drip on occasion, and Buzby loved to jump up, sit in the sink, and drink the drips! Shadow preferred his water “stirred,” he would pull his paw through the bowl, then lick the water off! I used to think cats loved milk, but soon learned they often had the problems you discussed. Then it was a constant battle to keep the kitties from licking out of ice cream bowls! We had to wash them immediately. One thing I learned AFTER my first kitten, Buzby, was don’t handle them too roughly as you play. If you are gentle (as I was with Karma), the adult cat will be gentle. Otherwise, the cat will not realize how much stronger he is, and YOU’LL be the one to pay! Thank you for your comments. Yes I learned about gaps when I moved to a new house and one of my cats managed (not sure how as I could never find the gap) to get behind the sink unit and then underneath the cupboard area. I got most of the house construction crew to hunt over the estate to look for her as I thought she had got out of the house… Until she popped up completely unaware of the furore she caused. And yes definitely be gentle whilst playing. You provide some really good tips to having a happy and healthy kitten. I like how you mention that playing and socializing is a critical part of this process. I find that playing with my cats is a paramount part of integrating them into our household. They appreciate the attention and affection. Anyone thinking about getting a kitten or new kitten owners should read this post! Thanks very much for your comment – I definitely think cats have affection for their humans and the more affection they get the more they seem to give. Kittens are so adorable. I have had a couple of my cats have babies in my lifetime and it is so cool to watch a momma cat give birth! I was actually pregnant the same time my cat was 🙂 We usually keep one of the baby kittens and find homes for the others. I have 2 cats now, a mom and her son. I have over the last few years, moved away from having lots of cats ( I used to have 6!). Cats are fun and cuddly, but I hate how they like to pee on things! I actually prefer dogs nowadays 🙂 Do you have any tips on keeping adult cats from urinating on your furniture/clothes? 4 Stress or territorial issues. If you have a number of cats some of them might not feel comfortable with their territory. Try a feliway diffuser or more areas for them to climb and hide. 5. Make sure cats are neutered as male cats especially will mark their territory. 6 Get the cat checked out at a vet so that any urinary tract disease or any other health issues can be ruled out. There are some more things to try.